This document will provide instructions on how to sort email in Outlook on the web, Outlook 2016 for Windows, and Outlook 2016 for MacOS. Select the Mail icon from the app launcher near the top-left corner of the screen. In the middle pane, click Filter. A context menu you will appear that gives you various options for sorting your email messages. This filter can be adjusted separately for each individual folder in your mailbox. 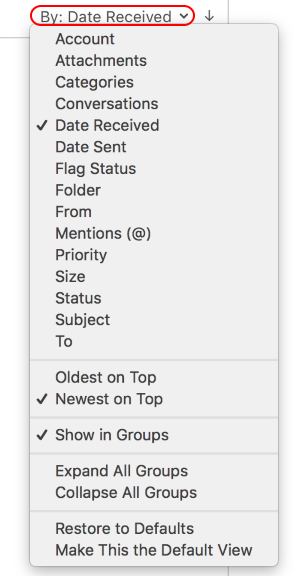 Use Sort by to sort by date, from, to, subject, attachments, importance, or size. Use Show as to view emails as threaded conversations or individual messages. Select the Mail icon from the navigation bar near the bottom-left corner of the screen. In the middle pane, click the small down arrow. A context menu you will appear that gives you various options for sorting your email messages. This filter can be adjusted separately for each individual folder in your mailbox. In the middle pane, click the label and down arrow next to By:. A context menu you will appear that gives you various options for sorting your email messages. This filter can be adjusted separately for each individual folder in your mailbox.